Another “NICE ONE” wonderful fishing day! Limiting out the big AJ’s (Amberjacks) is more fun than one person should have. Those grouper, porgies and big snappers just keep jumping in the boat, making me wish there were even more hours in the day just to keep fishing with Capt. Ryan. 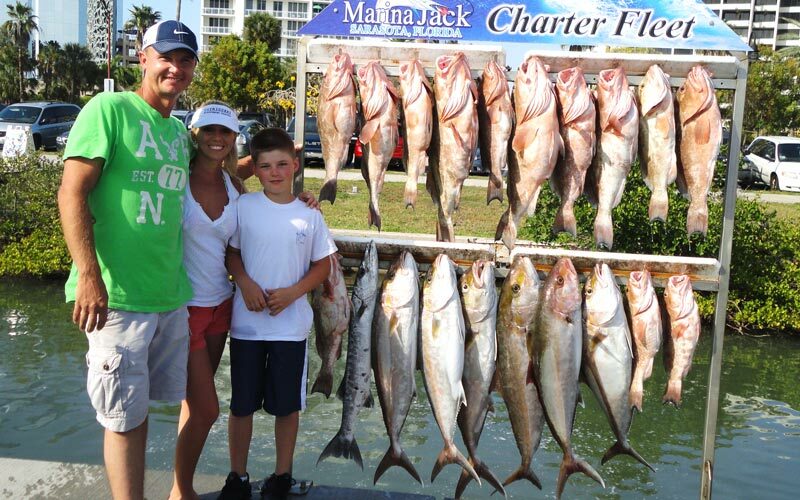 He provides a truly WORLD CLASS fishing experience, and I highly recommend him and the Outriggers Charter Fishing. Spiderman “aka” Michael B. My favorite fish to catch and eat is Snapper! I try to go out with Ryan every full moon if they are in season. Save my trip days, you promised! Scott H.
I have a really nice boat, huge fish finder and I have great off shore numbers of numerous great spots, but when I really want to catch fish I go out with Outriggers. Jeff H.
My brother Scott has been friends with Captain Ryan for 12 years. When I come to Sarasota to visit Scott, he always makes me take him out on the Nice One. That’s the name of the Outriggers Sport Fishing charter boat. Every time we’re out on the Nice One, we slay the fish. I’m glad my little brother Scott has good friends like captain Ryan. Tom S.